17' long to cover standard sized doors up to 36" x 84"
The PDS Rubber is a high performing perimeter soundproofing rubber door seal that can be installed on the door stop as well as the door jamb. 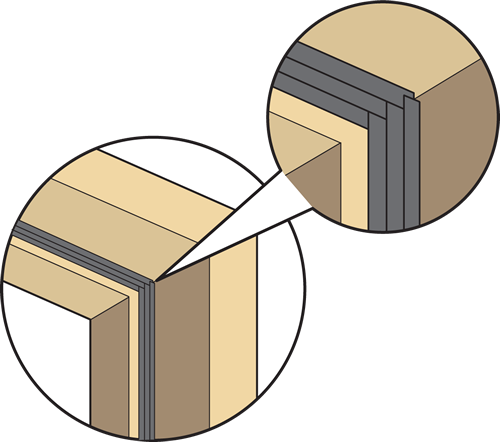 When the door is closed against the PDS Rubber, the unique triple fin design collapses creating dead air space within the rubber seal. When a second PDS Rubber door seal is installed away from the first, a larger dead air space is created and the redundancy helps to ensure a full seal in the corners. The rubber compresses easily allowing the door to shut with a low closing force without creating gaps in the corners. We recommend two sets of PDS Rubber for higher performing isolation doors. Doing so will maximize the performance of the soundproofing door seals to a near zero loss perimeter seal performance. Any solid core or solid wood woor will only need a single PDS Rubber and is recommended to be installed on the door jamb in this case. Each PDS Rubber ships with full installation instructions from the manufacturer. A brief description of the installation can be found below. The PDS Rubber is a peel and stick product that can be adhered to the door stop as well as the jamb to seal the perimeter of the door. If installed in multiple rows, then allow some space between each row of PDS Rubber to create dead air space the rows. Where the top and side pieces meet, you can miter the corner or interlock the triple fins. We recommend interlocking the fins for easier installation and to avoid cutting the rubber incorrectly. Apply the PDS Rubber to a door stop or jamb that is clean, dry, and has not been painted or stained within a week of installation. The PDS Rubber will reach full adhesion strength 24 hours after installation. Refer to the drawing below for placement of a single PDS Rubber on the jamb near the door stops. The PDS Rubber is shipped as a roll in lengths of 17', 20', or 25', depending on which length is required for your door. The standard length of 17' will cover a standard 7' tall door or smaller. The 20' length will cover a standard 8' tall door or smaller. The 25' length will cover a full sized double door. Measure the width of your door jamb and height of both door jambs, add the measurements together and round up to the nearest foot. Most doors will require the 17' rolls of PDS Rubber. With proper installation and two sets of PDS Rubber, our independent sound tests have shown this installation to perform better than, or at least as well as, any of the large adjustable door stop sets. With multiple PDS Rubber seals, a large dead air space can be created maximizing the performance of the seal design. The redundancy also ensures a successful seal in the corners, typically the weakest point of any perimeter seal system and the number one reason the heavy adjustable door stops fail to perform as expected. We have found in our own testing that the size of the perimeter door seal is not crucial. The important attributes are the ease of installation, quality of the foam or rubber in the seal, and the ability to have the seal come in full contact with the door along the entire perimeter door seal. Reducing the number of PDS Rubber installed from two sets to one set will drop the performance of the seals by 1-3 STC points, assuming the slab performs above STC 40. This drop is not huge and actually about how much is lost when using traditional heavy duty adjustable stops. A solid core or solid wood door will rate between 25 to 30 STC when fully sealed. To maintain this maximum of 30 STC, we recommend two sets of PDS Rubber per door. For standard hollow core doors, one set of PDS Rubber can be used to seal the perimeter.